This volume, together with Innovations in Organic Synthesis, Tsuji's previous title, provides complete coverage of over 40 years of organopalladium chemistry. 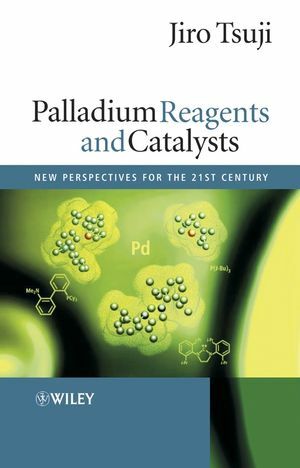 Jiro Tsuji is the author of Palladium Reagents and Catalysts: New Perspectives for the 21st Century, published by Wiley. 1 The Basic Chemistry of Organopalladium Compounds. 1.1 Characteristic Features of Pd-Promoted or –Catalyzed Reactions. 1.2 Palladium Compounds, Complexes, and Ligands Widely Used in Organic Synthesis. 1.3 Fundamental Reactions of Pd Compounds. 1.3.5 β-H Elimination (β-Elimination, Dehydropalladation). 1.3.6 Elimination of β-Heteroatom Groups and β-Carbon. 1.3.7 Electrophilic Attack by Organopalladium Species. 1.3.8 Termination of Pd-Catalyzed or –Promoted Reactions and a Catalytic Cycle. 1.3.9 Reactions Involving Pd(II) Compounds and Pd(0) Complexes. 2 Oxidative Reactions with Pd(II) Compounds. 2.2.3 Reactions with Alcohols and Phenols. 2.2.4 Reactions with Carboxylic Acids. 2.2.6 Reactions with Carbon Nucleophiles. 2.2.8 Reactions with Aromatic Compounds. 2.2.9 Coupling of Alkenes with Organometallic Compounds. 2.3 Stoichiometric Reactions of π-Allyl Complexes. 2.4 Reactions of Conjugated Dienes. 2.7 Homocoupling and Oxidative Substitution Reactions of Aromatic Compounds. 2.8 Regioselective Reactions Based on Chelation and Participation of Heteroatoms. 2.9 Oxidative Carbonylation of Alcohols and Amines. 2.11 Enone Formation from Ketones and Cycloalkenylation. 3 Pd(0)-Catalyzed Reactions of sp2Organic Halides and Pseudohalides. 3.2 Reactions with Alkenes (Mizoroki–Heck Reaction). 3.2.3 Reaction Conditions (Bases, Solvents, and Additives). 3.2.6 Formation of Neopentylpalladium and its Termination by Anion Capture. 3.2.9 Reactions with 1,2-, 1,3-, and 1,4-Dienes. 3.2.10 Amino Heck Reactions of Oximes. 3.3 Reactions of Aromatics and Heteroaromatics. 3.3.2 Intermolecular Arylation of Phenols. 3.3.3 Intermolecular Polyarylation of Ketones. 3.3.4 Intramolecular Arylation of Aromatics. 3.4.2 Reactions of Terminal Alkynes to Form Aryl- and Alkenylalkynes (Sonogashira Coupling). 3.4.3 Reactions of Internal and Terminal Alkynes with Aryl and Alkenyl Halides via Insertion. 3.5 Carbonylation and Reactions of Acyl Chlorides. 3.5.2 Formation of Carboxylic Acids, Esters, and Amides. 3.5.3 Formation of Aldehydes and Ketones. 3.5.4 Reactions of Acyl Halides and Related Compounds. 3.6 Cross-Coupling Reactions with Organometallic Compounds of the Main Group Metals via Transmetallation. 3.6.2 Organoboron Compounds (Suzuki–Miyaura Coupling). 3.6.4 Organozinc Compounds (Negishi Coupling). 3.6.6 Organosilicon Compounds (Hiyama Coupling). 3.7 Arylation and Alkenylation of C, N, O, S, and P Nucleophiles. 3.7.1 α-Arylation and α-Alkenylation of Carbon Nucleophiles. 3.7.2 Intramolecular Attack of Aryl Halides on Carbonyl Groups. 3.7.3 Arylation of Nitrogen Nucleophiles. 3.7.4 Arylation of Phenols, Alcohols, and Thiols. 3.7.5 Arylation of Phosphines, Phosphonates, and Phosphinates. 3.8 Miscellaneous Reactions of Aryl Halides. 3.8.1 The Catellani Reactions using Norbornene as a Template for ortho-Substitution. 3.8.2 Reactions of Alcohols with Aryl Halides Involving β-Carbon Elimination. 3.8.3 Hydrogenolysis with Various Hydrides. 3.8.4 Homocoupling of Organic Halides (Reductive Coupling). 4 Pd(0)-Catalyzed Reactions of Allylic Compounds via Π-Allylpalladium Complexes. 4.1 Introduction and Range of Leaving Groups. 4.2.1 Stereo- and Regiochemistry of Allylation. 4.2.3 Allylation of Stabilized Carbon Nucleophiles. 4.2.4 Allylation of Oxygen and Nitrogen Nucleophiles. 4.2.5 Allylation with Bis-Allylic Compounds and Cycloadditions. 4.3 Reactions with Main Group Organometallic Compounds via Transmetallation. 4.3.1 Cross-Coupling with Main Group Organometallic Compounds. 4.3.2 Formation of Allylic Metal Compounds. 4.3.4 Reactions of Amphiphilic Bis-π -Allylpalladium Compounds. 4.5 Intramolecular Reactions with Alkenes and Alkynes. 4.6 Hydrogenolysis of Allylic Compounds. 4.6.1 Preparation of 1-Alkenes by Hydrogenolysis with Formates. 4.6.2 Hydrogenolysis of Internal and Cyclic Allylic Compounds. 4.7 Allyl Group as a Protecting Group. 4.9 Reactions via π -Allylpalladium Enolates. 4.9.1 Generation of π -Allylpalladium Enolates from Silyl and Tin Enolates. 4.9.2 Reactions of Allyl β-Keto Carboxylates and Related Compounds. 4.10 Pd(0) and Pd(II)-Catalyzed Allylic Rearrangement. 4.11 Reactions of 2,3-Alkadienyl Derivatives via Methylene-π -allylpalladiums. 5 Pd(0)-Catalyzed Reactions of 1,3-Dienes, 1,2-Dienes (Allenes), and Methylenecyclopropanes. 5.1 Reactions of Conjugated Dienes. 6 Pd(0)-Catalyzed Reactions of Propargyl Compounds. 6.1 Introduction and Classification of Reactions. 6.2 Reactions via Insertion of Alkenes and Alkynes. 6.4 Reactions of Main Group Metal Compounds. 6.5 Reactions of Terminal Alkynes; Formation of 1,2-Alkadien-4-ynes. 6.6 Reactions of Nucleophiles on Central sp Carbon of Allenylpalladium Intermediates. 6.7 Hydrogenolysis and Elimination of Propargyl Compounds. 7 Pd(0)- and Pd(II)-Catalyzed Reactions of Alkynes and Benzynes. 7.1.3 Hydroamination, Hydrocarbonation, and Related Reactions. 7.1.4 Hydrometallation and Hydro-Heteroatom Addition. 7.1.5 Dimetallation and Related Reactions. 7.1.6 Cyclization of 1,6-Enynes and 1,7-Diynes. 7.1.8 Homo- and Cross-Coupling of Alkynes. 7.2.2 Addition Reactions of Arynes 595 References. 8 Pd(0)-Catalyzed Reactions of Alkenes. 9 Pd(0)-Catalyzed Miscellaneous Reactions of Carbon Monoxide. 10 Miscellaneous Reactions Catalyzed by Chiral and Achiral Pd(II) Complexes.